A beautiful round trinket box, 3 designs to choose from Bridesmaid, Mother of the Bride and Mother of the Groom. These amazing trinket boxes have a cream velvet lining and measure 70mm in diameter and 40mm deep. 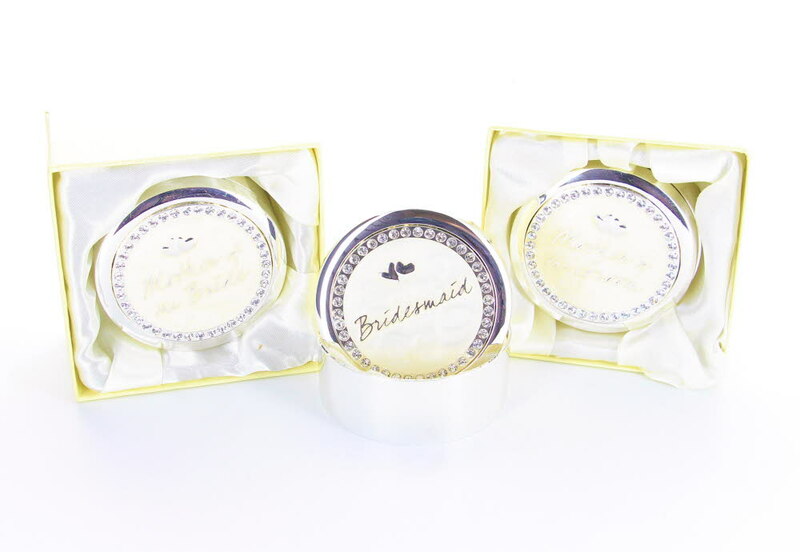 They have diamante detail around the edge of the lid with a cream marble effect within the diamantes and the words Bridesmaid, Mother of the Bride and Mother of the Groom written in silver, it has 2 silver hearts too. We will engrave your personalised text around the base of the trinket box. Each trinket box comes with a cream satin lined box with a clear lid. These make amazing keepsakes for your Wedding Day.